Cologne - Amidst all the brouhaha surrounding FC Bayern München's ongoing injury epidemic, the blossoming form of the 2014/15 Bundesliga champions' upcoming opponents, Bayer 04 Leverkusen, has been somewhat overlooked. Currently averaging four goals per game on home turf and unbeaten in their last nine league outings, Roger Schmidt's side are hitting the peak of their powers at just the right time. 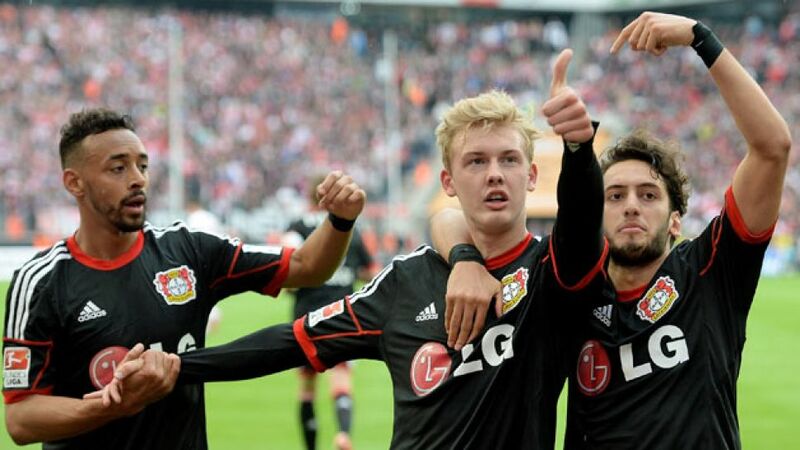 Yet while it was right-wing sensation Karim Bellarabi earning the majority of the plaudits earlier in the campaign, attentions have more recently switched to prodigious 19-year-old winger Julian Brandt. The Bremen native joined the Werkself in January 2013, having scored goals for fun - 27 in 48 outings - during a two-year spell in the VfL Wolfsburg reserves. At the time, Leverkusen director of sport Rudi Völler described him "as one of the most talented players in German football", but over a year had passed before the then Under-17 international was given the opportunity to showcase his talents to a wider audience for the first time. Brandt made a relatively assured start to life in Germany's top-flight as a substitute in a 2-1 defeat to FC Schalke 04 on 15 February 2014, with further appearances from the bench coming against the likes of Wolfsburg and Paris Saint-Germain. After registering his maiden Bundesliga assist in a 3-1 win over FC Augsburg, he started all six of Leverkusen's remaining league games of 2013/14, scoring twice - including on his full debut in a 2-1 reverse at Hamburger SV - as well as laying on a goal for Gonzalo Castro in a pulsating 2-2 draw with Borussia Dortmund. The stage was set for Brandt to become one of Bayer 04's integral figures under new head coach Schmidt, but the arrival of Hakan Calhanoglu from Hamburg, coupled with Bellarabi's breakthrough following a loan spell at relegated Eintracht Braunschweig, restricted the 2013 UEFA European U-19 Championship winner to just 319 minutes of playing time over the course of the entire 2014/15 Hinrunde. Only upon South Korean international Heung-Min Son's departure for the 2015 Asian Cup was Leverkusen's super talent restored to the starting XI. Operating in his favoured position on the left-hand side of an attacking triumvirate charged with supplying the ammunition for either Stefan Kießling or Josip Drmic, Brandt's raw power and willingness to take on opposition defenders demonstrated exactly why he has always been held in such high regard by the Leverkusen hierarchy, not to mention the youth set-up at international level (at one point, he represented Germany's U-17s and U19s a year ahead of his age group). More recently, Schmidt has tended to rotate his front four, with Brandt starting five and featuring in nine of the North-Rhine Westphalian outfit's last ten games in all competitions, of which Leverkusen have lost only once (on penalties to Bayern in the DFB Cup quarter-finals). He scored his second league goal of the campaign in the 4-0 rout of Hannover 96 on Matchday 29 and stepped off the bench a week later to open the scoring in an eventual 1-1 draw away to local rivals 1. FC Köln. It's now with that fervent derby backdrop still fresh in his mind that Brandt will hope to make a similar impact against a Bayern side ravaged by injury in the exact same positions where Leverkusen thrive. The champions will be without two of their best men in Arjen Robben and Franck Ribery when the sides convene at the BayArena on Saturday evening, but the Bundesliga's 'eternal bridesmaids' - so called on account of Bayer 04 having never won the league - boast their very own page boy more than capable of filling the spotlight.